State Rep. Dr. Brad Barrett (left) and Jacob Cox share 'Stop the Bleed' with legislators. Reid Health Emergency Services team members took the ongoing “Stop the Bleed” education outreach to the state capitol this week as part of an effort to pass a bill to get program kits in every school in the state. 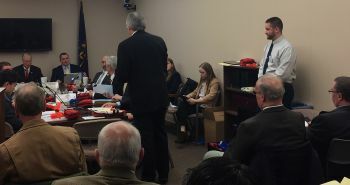 Cox and Williams joined EMS, fire and law enforcement personnel from around the state to share a short training session with a committee of legislators on use and purpose of the kits. “The information I provided will be used to help aid them in making a decision to push this through the House,” Cox said. As part of the session, Cox and Williams illustrated how to appropriately apply and use the tourniquets that come in the kits. Trauma centers across the state and in the nation are providing Stop the Bleed education to schools and other public entities. The Reid Health outreach effort received a unique boost with support from the Reid Health Foundation to fund the kits and training in the health system’s eight-county coverage area. The Reid outreach team provided training and kits so far to eleven schools for a total of 111 kits available for more than 4,500 students. The program is designed to save lives by having equipment and trained staff who can quickly stop life-threatening bleeding. With a serious injury, a person can bleed to death in less than five minutes -- often before trained emergency help can arrive. The Foundation funds are providing “Stop the Bleed” kits to area schools where a previous Foundation campaign also funded AED stations – automated defibrillators that have already been used to save lives in emergency situations. Four kits containing tourniquets, bandages and other supplies are being placed in schools in Wayne, Randolph, Henry, Fayette and Union counties in Indiana and in Preble and Darke counties in Ohio.